I mean, if the condition is satisfied, root is already established to the "right" parent dir, and the result of find --set-root in the best of cases won't change root (but will take some time to execute), in the worse will establish root to another device that is searched before the current root one. seems to make more sense to me. The find statement is redundant and I will make changes accordingly. and present in the available UEFI_MULTI download. 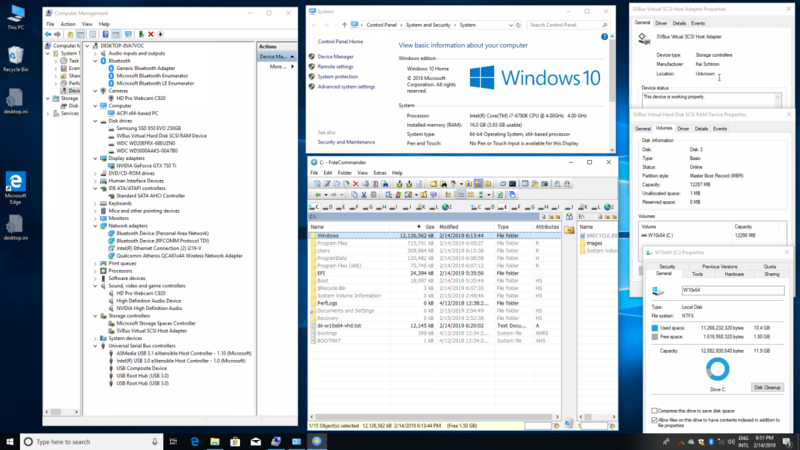 - In Windows 10 use BOOTICE to make UEFI Grub2 entry for the internal disk having FAT32 partition. 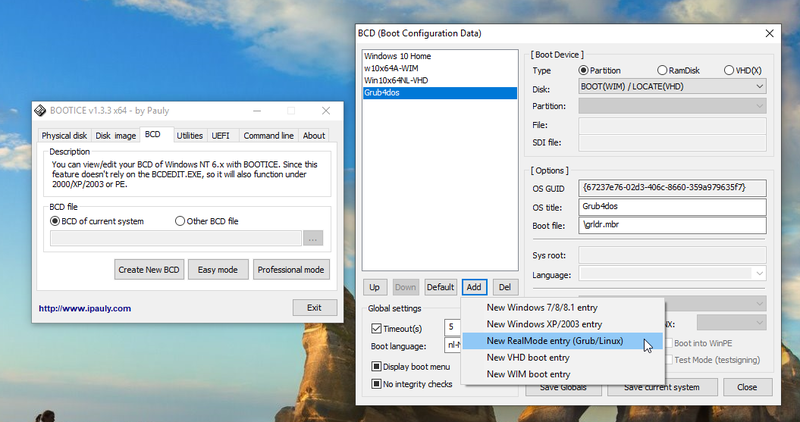 BOOTICE can be used to Add WIM and VHDX to Boot Manager Menu as described in Win10_Inst_Eng.pdf. Thanks for feedback and reporting problem with program UEFI_MULTI. 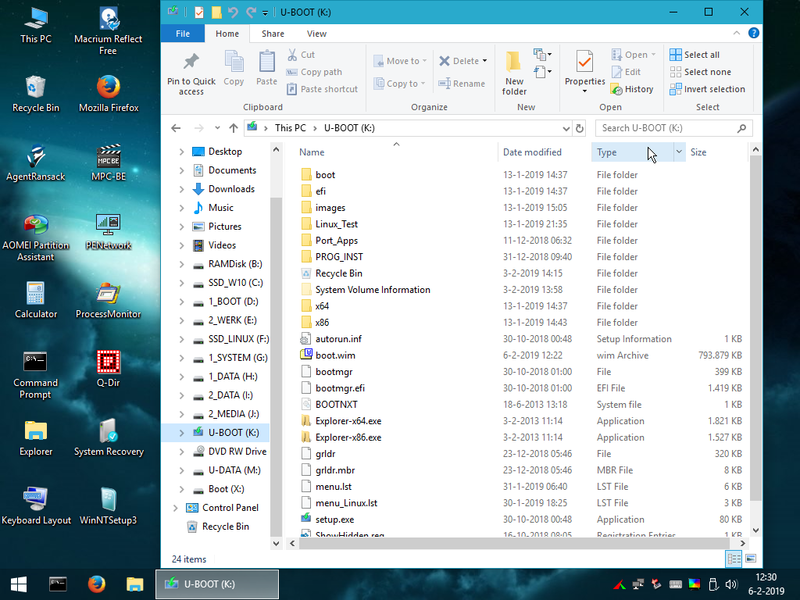 The Source Folder is meant for Content that you want to be copied to USB Target. When that Source Folder is an Empty folder then the reported Error occurs. In the dialogue I have made things clear by using the Label Content Folder instead of Source Folder. Tooltip text is available as Help and will be displayed when the mouse is hovered over the control. You want the WinPE - WIM file to be copied to a Destination Folder on USB Target. For that purpose you must select as USB Target a folder on Boot Drive (max 8 characters) instead of selecting a drive. 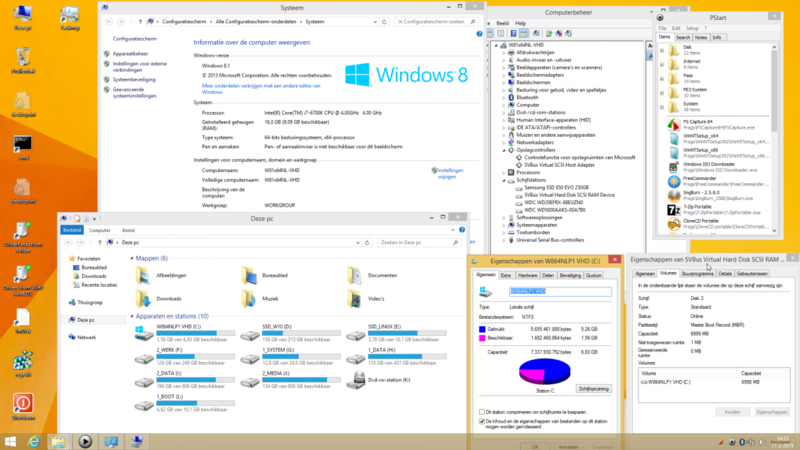 I have fixed the program UEFI_MULTI and version 8.7 is available for download. Can I boot Windows (8/10) ISO from grub2 in UEFI mode? Grub2 can be used to chainload Windows Boot Manager and then boot with WIM or VHDX file. and then in UEFI_MULTI_x64.exe select the boot.wim file of that ISO. In this way you can create on USB the boot entry for your boot.wim file. and have the Programs Folder on USB. In that case you need UEFI_MULTI Settings as shown so that Programs folder is copied as Folder on Boot Drive. 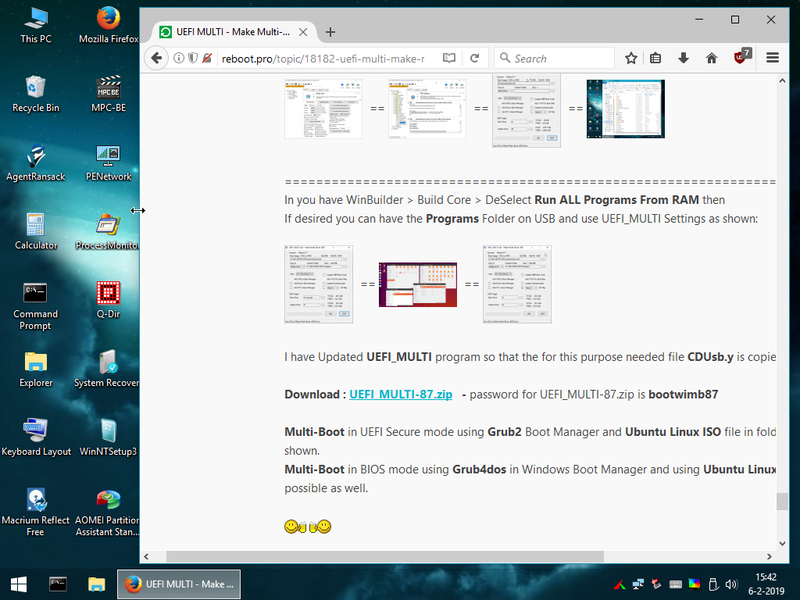 Multi-Boot in UEFI Secure mode using Grub2 Boot Manager and Ubuntu Linux ISO file in folder images is possible as shown. Multi-Boot in BIOS mode using Grub4dos in Windows Boot Manager and using Ubuntu Linux ISO in folder images file is possible as well. That is about UEFI Grub2 booting of Linux ISO files and about MBR wimboot of Windows ISO file. 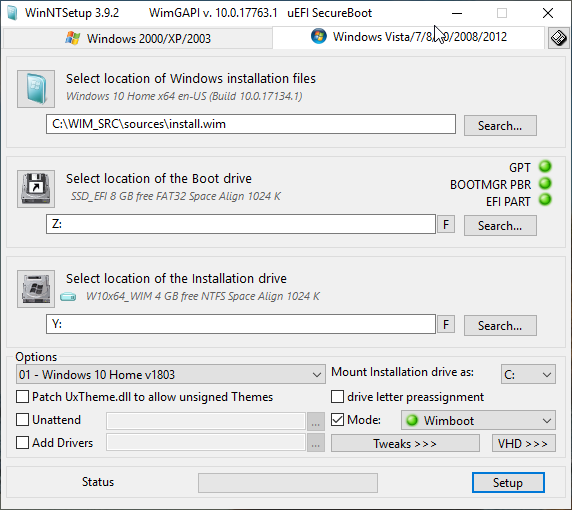 UEFI wimboot of Windows ISO file is not supported yet .... and Secure will be most likely impossible. It only works for MBR\Legacy booting (wimboot for UEFI does not work unless you boot to iPXE via UEFI). What would be the advantage of using an ISO instead of a WIM file for you ? For me the functionality is the same. In both cases we can have one file that contains all the information for booting with Win10XPE in RAMDISK. 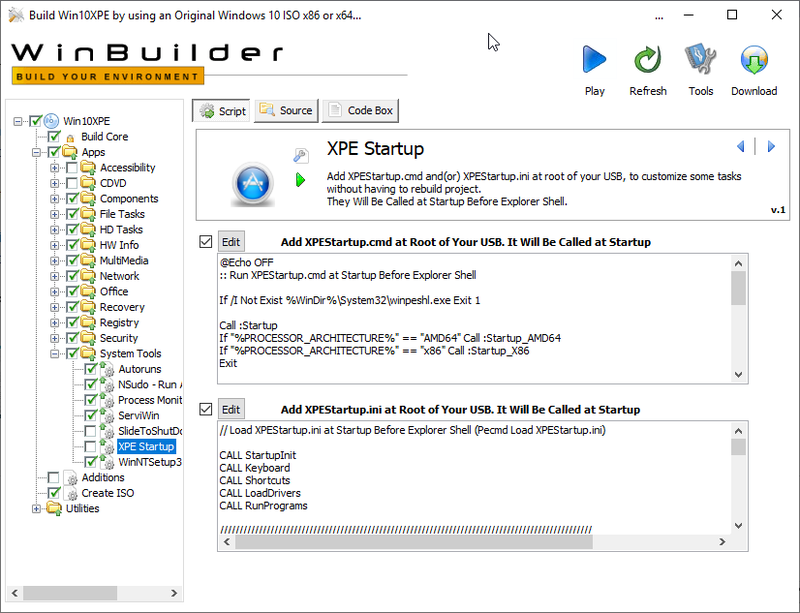 Using a Win10XPE WIM file is more convenient than using a Win10XPE ISO file. All boot options are made with UEFI_MULTI and are direct available on booting. Grub4dos loads the 3.9 GB VHD into RAM in 1 minute and then Win7 x64 boots from RAMDISK in 8 seconds. All drivers were installed in source so that OS Source = 8 GB and all drivers are working OK. Advantage: VHD Size 3.9 GB can be located on FAT32 USB-Stick for booting from RAMDISK. For VHD Size > 4 GB and for booting as FILEDISK, then VHD must always be located on NTFS partition. UEFI_MULTI can make Grub4dos menu entry for VHD booting with SVBus driver as FILEDISK or as RAMDISK. UEFI_MULTI makes entry in Windows Boot Manager for booting VHD as FILEDISK using Microsoft vhdmp.sys driver. 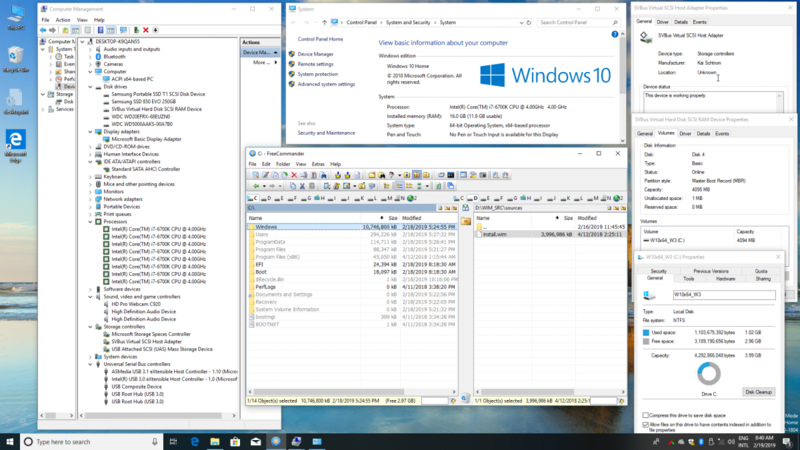 WinNTSetup can be used for WIMBOOT Install of Win10 x64 in VHD connected to file install.wim elsewhere on harddisk. Grub4dos does NOT support VHDX file format, so you must use Install in VHD for support of Grub4dos. 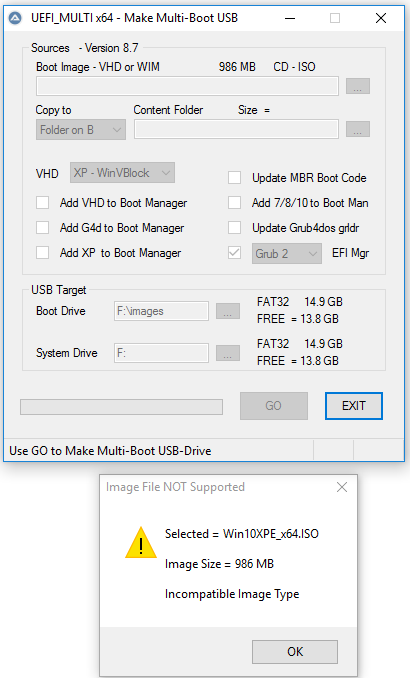 Install of Win10 in VHD is refused when VHD is located on USB. Best is to locate VHD on C drive and to use UEFI booting. Booting with Grub4dos from RAMDISK using SVBus driver is not simple, but possible for such WIMBOOT VHD. Install of SVBus driver is refused when VHD is booting in UEFI mode. 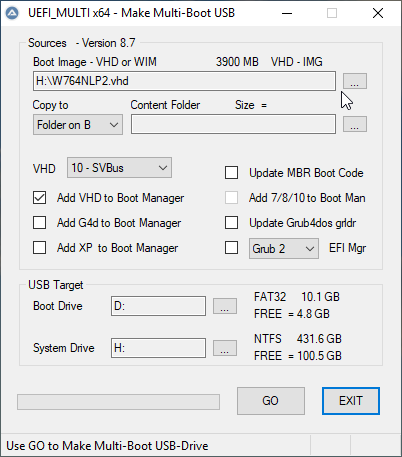 Use UEFI MULTI to make boot entry in USB Boot Manager menu for VHD located on internal harddisk. After booting from USB with WIMBOOT VHD then you can run as admin file instx64.exe of SVBus bin folder to install the driver. so that it can be located in VHD on USB of Size 2 GB with total boottime 30 seconds which is OK. 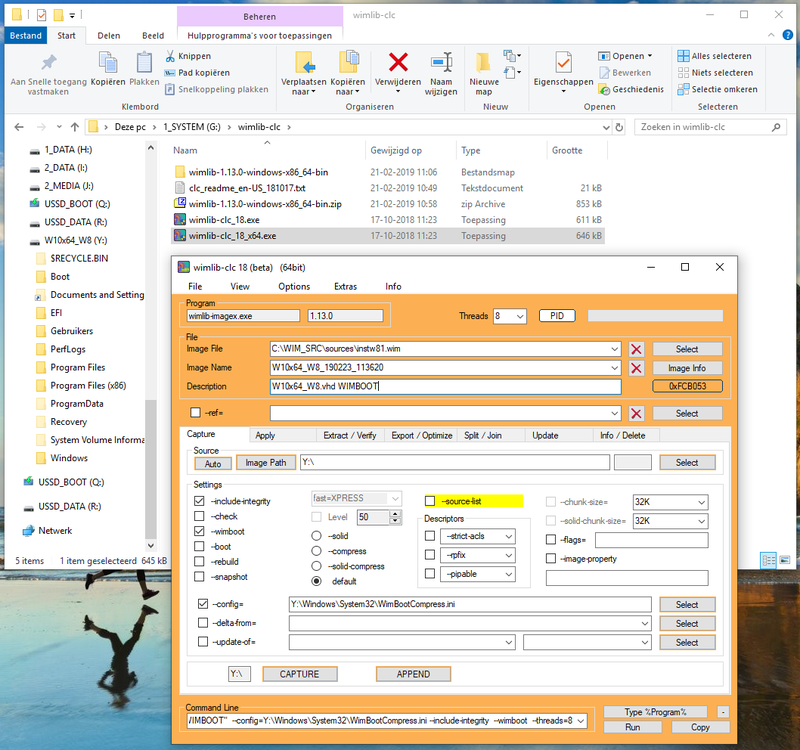 The CAPTURE WIM file is copied to folder sources on NTFS drive of Portable SSD. 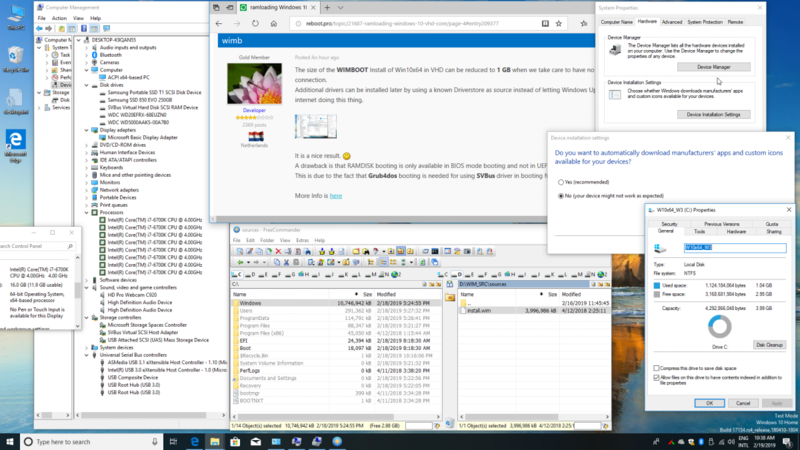 WinNTSetup can be used for WIMBOOT Install of Win10 x64 in small VHD of Size 2 GB on same NTFS drive of Portable SSD. Then use UEFI_MULTI again to make Grub4dos menu entry for booting VHD WIMBOOT as RAMDISK. 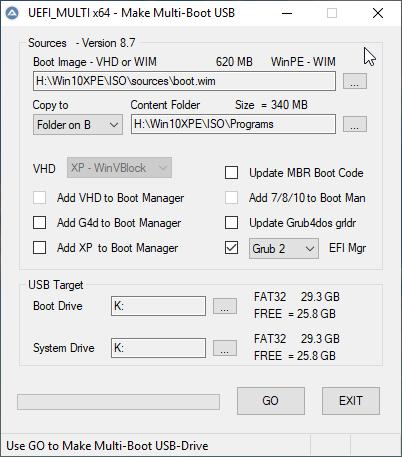 Reboot from USB and Select in Grub4dos menu your WIMBOOT VHD for booting from RAMDISK. 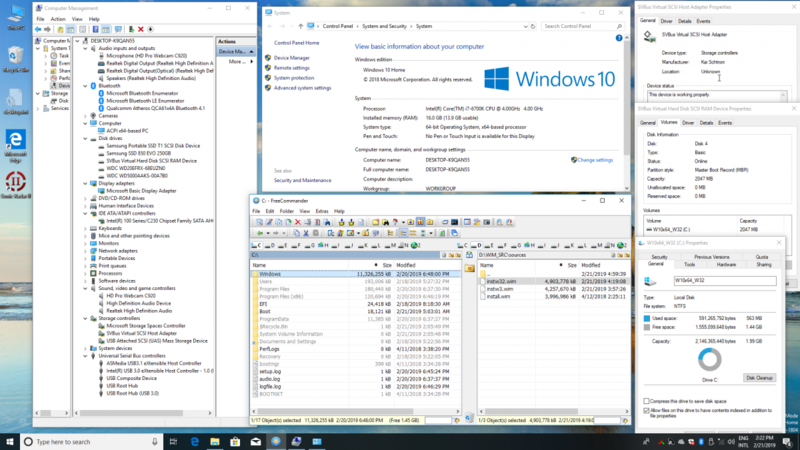 The VHD of Size 2 GB is loaded into RAM in 20 seconds and then Win10 x64 is booting in 10 seconds from RAMDISK. This is due to the fact that Grub4dos booting is needed for using SVBus driver in booting from RAMDISK. It includes AOMEI Partition Assistant and Macrium Reflect to make Backup Image. whereas in case of VHD and SVBus driver booting with Grub4dos then you are limited to BIOS mode only. 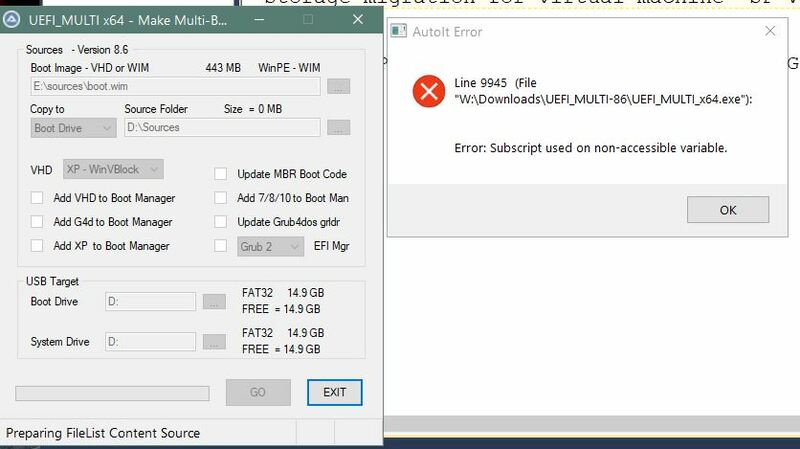 By the way wimb a suggestion: all WinPE Isos could be replaced with a boot.wim located into its own named folder as AIOCreator does, giving us then more options to boot in UEFI, not a single boot.wim as now. I will start puting some boot.wim files and modifiying both BCD's to test this approach. 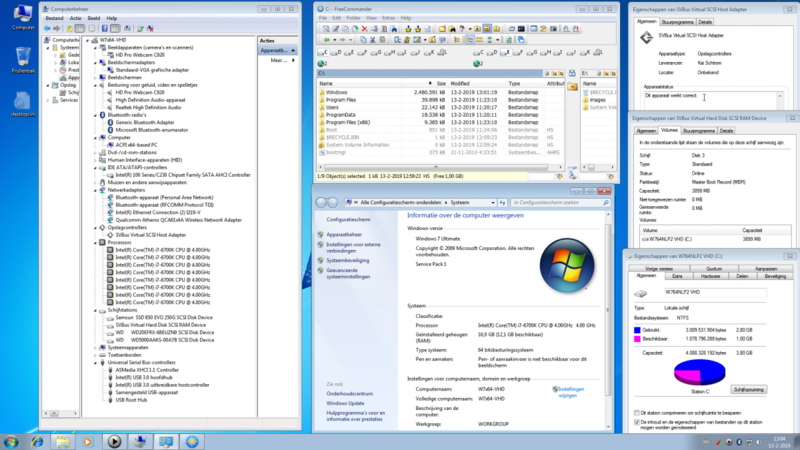 Very nice reduction in size for your wimboot VHD of Win 8 x64. I will have a look at your suggestion on WinPE ISO, but in fact a single WIM file is already a very convenient solution. Such WinPE WIM file is booting in UEFI Secure and in BIOS mode direct from Windows Boot Manager into RAMDISK. and you can in UEFI_MULTI Select a folder e.g. WinPE as Target Boot Drive U:\WinPE if you want to combine them in such folder. 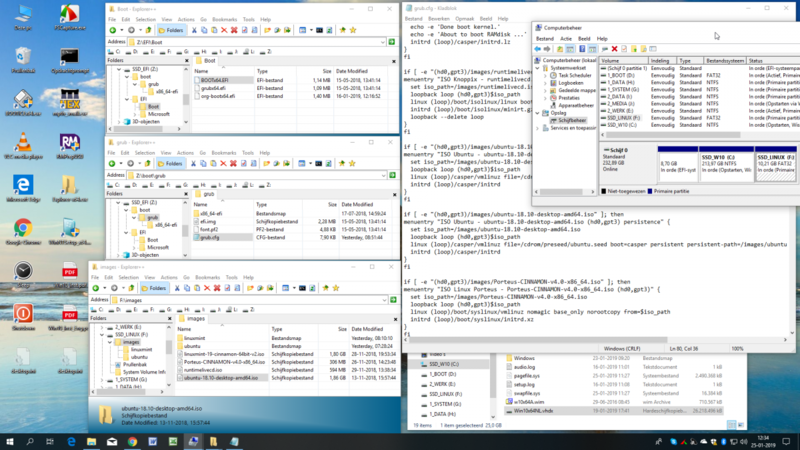 In my case a separate Programs folder can be selected as Content folder, which is Copied then as folder to USB. It is in fact 8.1x64 ESP1. This are good news, I will try it ASAP. I think the only advantage over 8.1 is going to be more drivers, and remembering starting with 1709 version you can see more than a single partition on portable (USB stick) drives, then I will not need diskmod anymore. 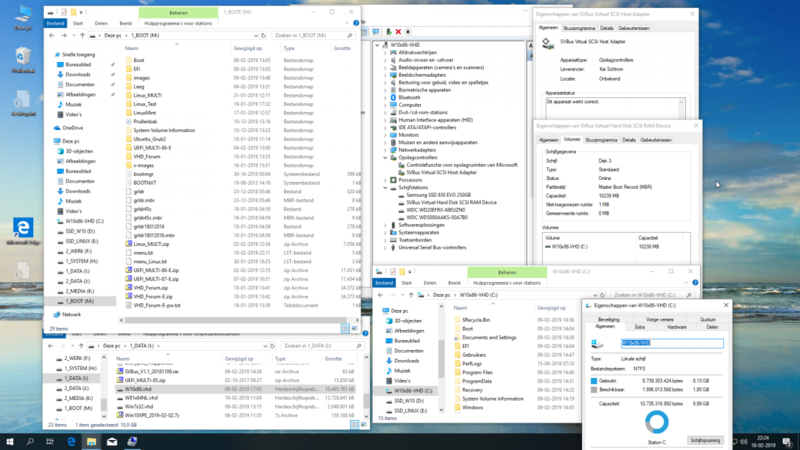 WinNTSetup can indeed be used for WIMBOOT Install of Win10 x64 in small VHD of Size 5 GB connected to file install.wim elsewhere on harddisk. That does not mean that booting with Grub4dos from RAMDISK using SVBus driver is possible for such WIMBOOT VHD. Nevertheless, it can be realised .... 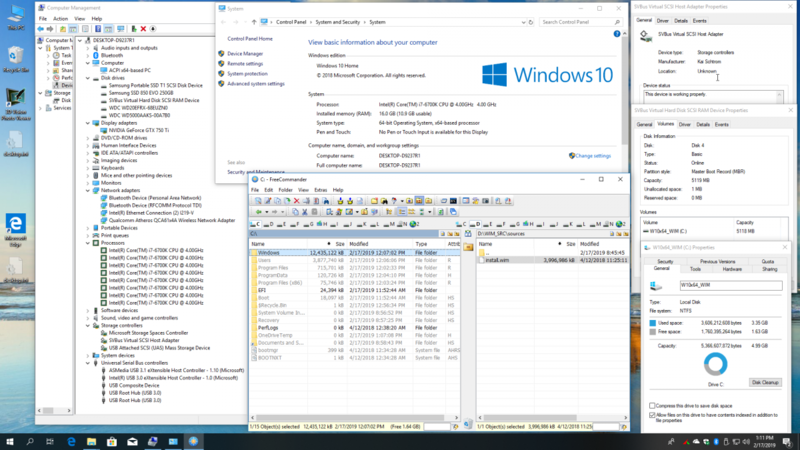 The VHD of Size 5GB is loaded into RAM in 45 seconds and then Win10 x64 is booting in 10 seconds from RAMDISK. I would appreciate if you can elaborate a few more starting with SVBus driver install up to the final RAMboot of wimboot VHD from grub4dos. I want to follow same approach I used with W864ESP1, to try to get the smaller size. 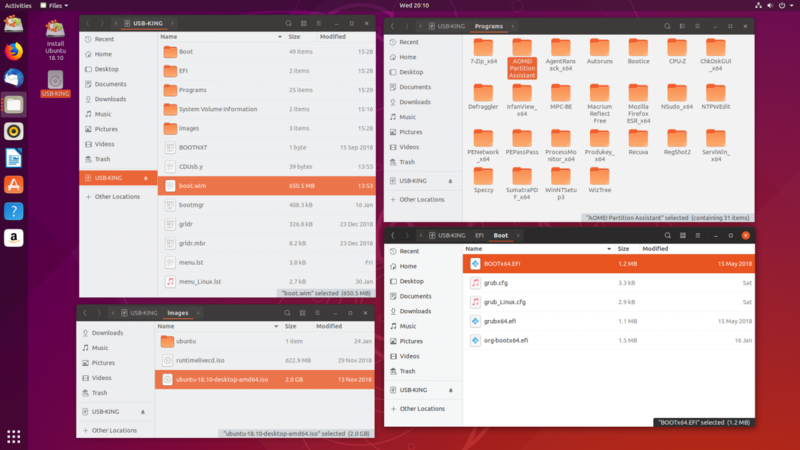 My test finished with troubles, made a fresh install of 10x64 Home 1803 on a VHD, and all was fine, I booted it several times untill finally get the desktop, only thing I did there was make the required changes to see all icons on desktop on Personalize/Themes and rebooted to my 8.1x64 VHD to use VHD_W8C_87 to make the Portable version on a 7 GB VHD, when tried to boot from it, all was runing fine, but after some time and before reaching desktop my PC freezed and I had to reboot (as you know no usefull info on the BSOD), now every time I want to boot my 7x64 main OS the PC starts cheking all partition on both disks, when it finish allways says every thing is fine, it is making me crazy. Any ideas to fix this behaviour will be appreciated, before I make use of my OS backup. EDIT: After last reboot, finally no more checking of all partitions every boot. But I will not try this again, 10 is like Russian roulette. I'm happy with my 8.1x64 mini VHD, and anyway I hate 10. 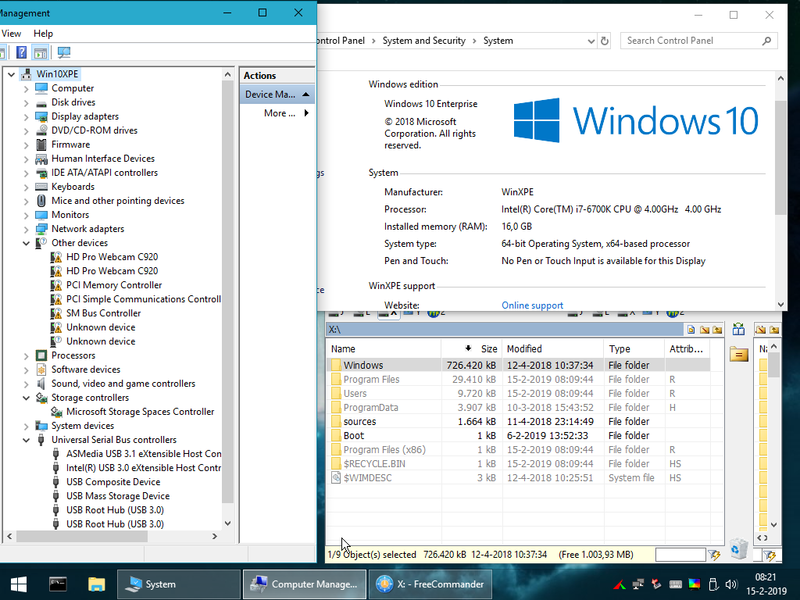 After reading again your last post, what I finally did in my UEFI MULTI is rename 4 boot.wim(s) as following: Win10x64-XPE.wim, ChrisPE-8.1x64.wim, MT-PartitionWizard-10_2.wim and PC-unlocker.wim and that created the respective lines on both BCDs to boot from each one of them on MBR and UEFI, of course also added some Isos and had to make some changes to menu.lst, but, I have now my own menu. VHD_W8C_87 is not meant to be used to reduce size of 10 x64 installed in VHD. 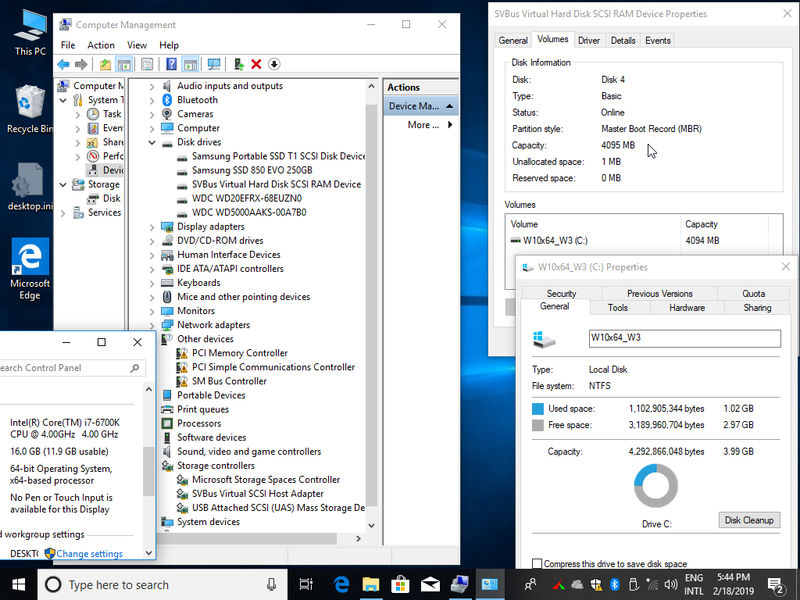 WinNTSetup can be used for WIMBOOT Install of Win10 x64 in small VHD of Size 5 GB connected to file install.wim elsewhere on harddisk. Grub4dos does NOT support VHDX file format, so you must use Install in VHD for support of Grub4dos needed later for RAMDISK booting. Install of SVBus driver is refused when VHD is located on GPT partition. Copy the WIMBOOT VHD to NTFS partition of UEFI/MBR USB SSD as described earlier. 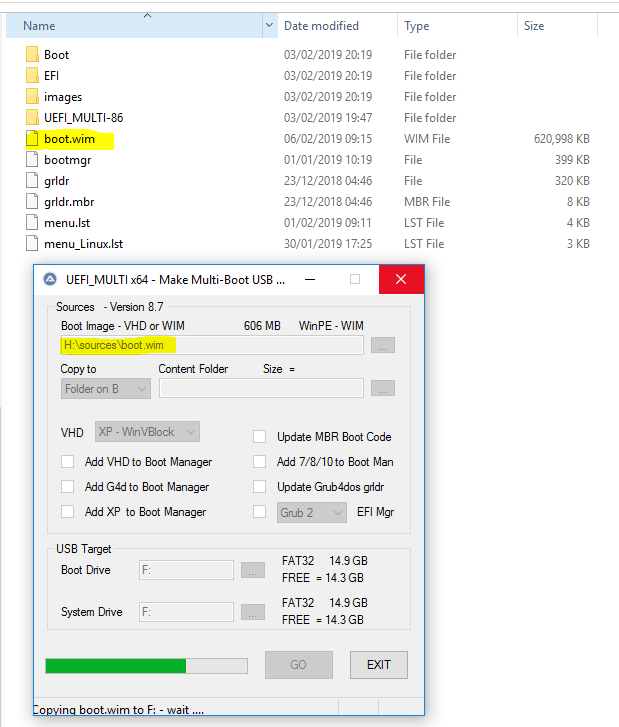 Use UEFI_MULTI to make boot entry in USB Boot Manager menu. Reboot to finalise Install of SVBus driver and shutdown the WIMBOOT VHD. Then use UEFI_MULTI again to make Grub4dos menu entriy for booting WIMBOOT VHD as RAMDISK. 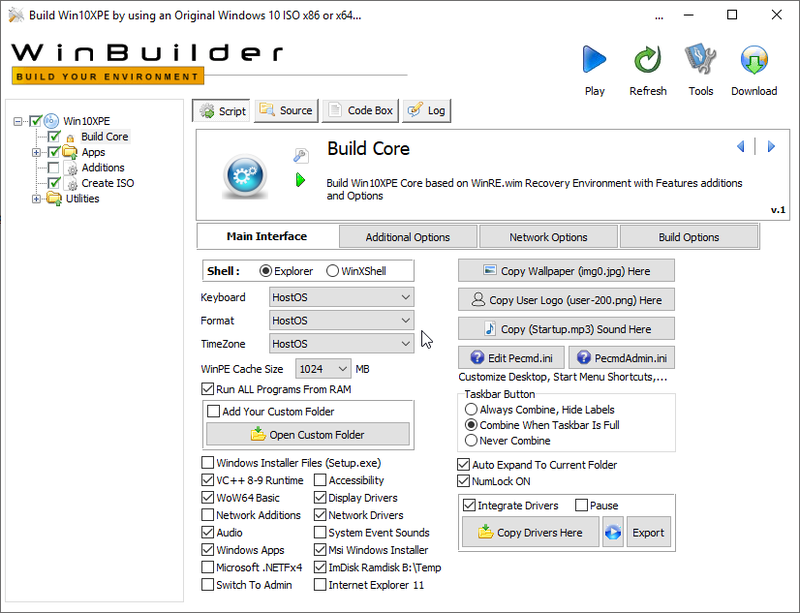 Additional drivers can be installed later by using a known Driverstore as source instead of letting Windows Update from internet doing this thing. I have used wimlib CAPTURE to make WIM file used by WinNTSetup for Install in 2 GB VHD.